As you may have seen from a previous post(Josefine Jönsson – Girl Of The Week) I’m pretty fond of this woman’s work. After the first couple of interviews I’d done on here (Lara Larsen & Romanie Smith) I looked back at my past Girl Of The Week posts and set about getting in touch for further interviews. Josefine Jönsson was the first to respond, and she graciously agreed to answer some of my questions. Hopefully you’ll learn something new, and if she’s completely unknown to you, I hope you find someone as inspirational as I have, in her. Thanks for agreeing to this interview. I’ve been admiring your work for a few years now, I even have a couple of signed photos by yourself of Starfucked on my wall. Let’s start at the beginning, What got you into photography and specifically how did you get into the alternative fashion/fetish(latex) photography scene? In my teen I was very interested in drawing realistic portraits. Back then I was listening to Japanese rock and was inspired by bands such as Dir en grey and D’espairsray who I also drew portraits of a lot. I did however start off with fashion photography, but as my own fashion was alternative during this period I guess it was quite natural that I wanted to shoot more alt fashion. When it comes to what got me into photography it’s mostly because I couldn’t express myself as I wanted with my drawings so I wanted to try other media. I shot a lot with my best friend Harriet and from there I really developed my love for photography. I can’t remember exactly when, but I also discovered Tea’s blog (Insanitea) where she posted corsets, latex outfits and modelling images. She kind of brought me into the latex fashion since our second shoot was Alice in Wonderland, but in a latex dress. And from there it just went on and alt models started to contact me and wanted to work. I did not have such a big portfolio with alt fashion so I did a lot of TFP to get to where I am today. And many, if not all, models are kind of my friends at this time. So it’s great because we all seem to have the same vision and we sometimes spend time together outside photography as well. You have quite a distinctive vibe to your photos, from capturing the absolute best of the models, to the spectacular locations, do you have specific things you look for when scouting for new locations? I love to shoot outdoors in forests, amongst flowers or nice buildings. It’s hard to describe what I look for but I always try to picture how it could look in my mind at this place. I sometimes stumble upon locations by going by train or bus here in Stockholm, and mostly it’s how the nature looks (much colours for example) that makes me interested in it. It’s hard to find new, nice locations here but it’s always good when there’s not much people close to them. For some reason, cemeteries here in Sweden are so pretty! It’s weird, but many of my shoots I’ve done on cemetery. So I guess that’s my favourite location, haha! Who, if any are your inspirations when it comes to your art? I guess I am inspired by many artists out there. From artists just started out and professional ones. But what I am most inspired by is nature, actually. I guess that makes sense, I’ve found that nature can be spectacularly overwhelming! I think one of the things that makes your work stand out from others is the processing, it’s hard to describe, but it’s almost as if there is an ethereal glow to your photos, certainly the finishing touch. Where did you learn to process in this way, are you self-taught? Thank you! I put a lot of my time and work into the retouching. I guess it’s a mixture, when I first started off it was a lot of experimenting until I found something I like. Then I was introduced into a whole new working flow (the skin retouch) by my partner who I met whilst studying photography. However, the colouring and toning has always been my favourite and that’s something I’ve learnt on the way. If you had to choose just one, what would be the favourite photo that you have taken? This is very hard. I have so many, if I may say so, favourites during the years. But I can hands down say this image of Sister Sinister is one of my favourites! I can absolutely see why. I chose this photo for the post I did on you previously, its perfect. You’ve worked with so many models over the years on so many shoots and locations, do you have one particular session that stands out for any reason? Always the cold ones. One in particular with Miss Loulou. We were freezing the whole shoot! It was so friggin’ cold. We did bring hot cocoa but it did not do much to help! We were shooting some corsets, and the images did turn out nice, but if we knew it was going to be so cold without any place to go indoors to warm up, perhaps we would have picked another day! Ah, but if you’d picked another day, maybe the photos would have turned out differently! If you could work with living or otherwise, past or present, who would you like to work with, and why? I’ve been following Miss Mosh for so many years now, and she’s a model I’ve always wanted to shoot with. But also of course Dita von Teese. Keira Knightley also, she’s so pretty and I love when she dresses up in Victorian dresses. Those would be some amazing photoshoots, maybe we can tweet them and give them a heads up next time they’re in Stockholm… 🙂 Speaking of Stockholm, Sweden, You live/work there. Has photography seen you travel much outside of it, and if so where was your favourite place to visit? I haven’t travel much since I did start with photography, more than around Stockholm and south of Sweden where I grew up. I really hope to change this. But I have to say when I visited Tea this summer on Gotland it was such a nice scenery, so I think I will have to say Gotland! Do you ever work with rock bands? I’ve seen wedding photography and other photos that are not purely fashion based, do you have any band promo shots in your portfolio? Would not say rock bands, but I’m working with Ashbury Heights and also filmed one of their music videos last year! I’ve also shot for their latest album ”The looking glass society”. As I have covered in the previous Girl Of The Week article, you’ve done some really great self-portrait shoots, when did you decide to get in front of the camera? What do you like to do for fun when you’re not in front or behind the lens? Do you have any hobbies? Watch TV, what shows? listen to music? Who is your favourite artist? I’m going to be boring and say that photography also is my hobby to whereas I practically always work with photography (retouching). But I like to enjoy walking in nature, cuddle with my love bird, spend time with family and friends. Play video games, listen to music such as Memphis May Fire, Asking Alexandria, White Lies, Bring Me The Horizon. By this point you’ve been published countless times, book covers, magazine covers, massive magazine spreads. What would you say is your most successful, or rather what is your most proud achievement? I think when I really got my very first cover which was appreciated a lot! I was even invited to their release party in London which I attended, back in 2011. 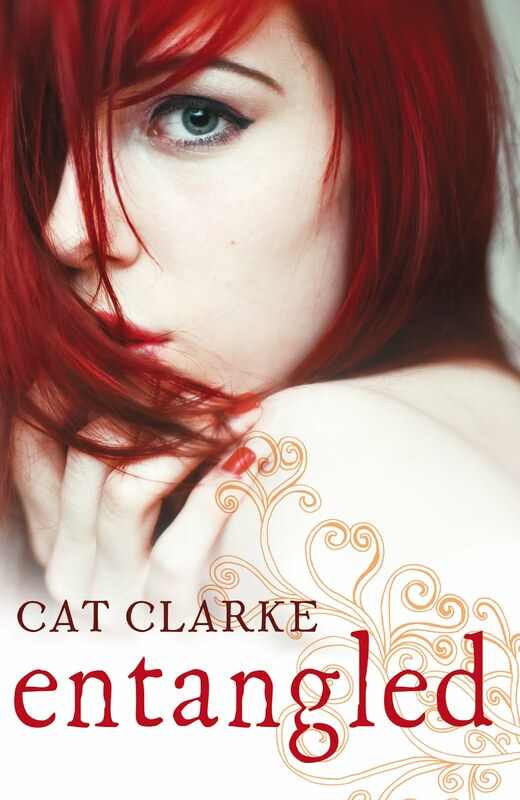 It was for Cat Clarke’s book ”Entangled”. But I am also proud to have covers for big authors here in Sweden such as Mari Jungstedt and Håkan Nesser. Do you have any big plans or goals for 2016? I really want to attend some fetish party to meet with more international models, so I am hoping to one at least. I am not much for parties, but it could be fun to meet up and actually show myself to the world more than only my images, haha! I know what you mean! I’d love to go to one of those parties too! How can we find out more about you and your work? Basically anywhere on art communities, I go by my name “josefinejonsson” or “josefinejonssonphoto”. If anyone has fallen in love with your photos and wants them printed where can they get them? Yes! I truly appreciate everyone who supports my work and purchases my art. 🙂 Most of my images can be purchased on my Etsy shop. If an image isn’t there, just message me and I can put it up! I also sign all prints (if wanted) and sometimes I even have signing with the models! Josefine, thank you so much for taking the time to answer my questions 🙂 Can’t wait to see new photos as you post them. I also hope you all enjoyed my answers and I look forward to post more of my work! And there you have it! A great interview with Josefine. She also left us with a couple more photos from her collection. Enjoy! Ste.